We were visiting in the middle of August and spent almost the entire day in and around the village. In all that time only two small buses of Chinese tourists turned up. Actually, in a contradictory sense you need a tour group to turn up if you want to see the residents wearing their traditional clothing and jewellery. They don’t wear them when they are tending to the fields or their livestock, or when an individual backpacker turns up. However, as soon as a bus arrives, the whole village downs tools, people put on their finest ethnic costumes and flood into the attractive main square to begin a song and dance routine that lasts for about 30 minutes. As soon as the performance finishes, the dancers pick up bags of ethnic clothing and silver and transform themselves from gentle, exotic dancers into voracious and astute saleswomen. Quite a sight to behold! Despite the touristy nature of the singing and dancing, everything is done with quite a lot of enthusiasm and the residents of Langde seem very proud of their culture. The best part of the performance are the beautiful Miao costumes and silver jewellery. Nobody seemed camera shy. 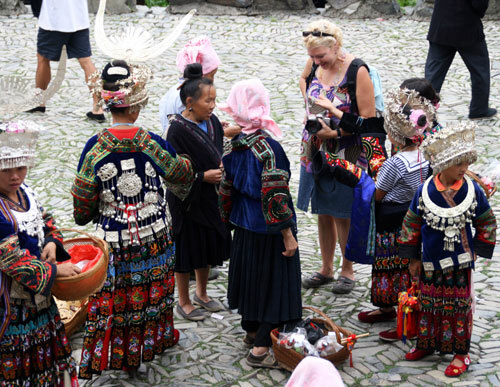 The Miao are not meek in front of the Han tourists. 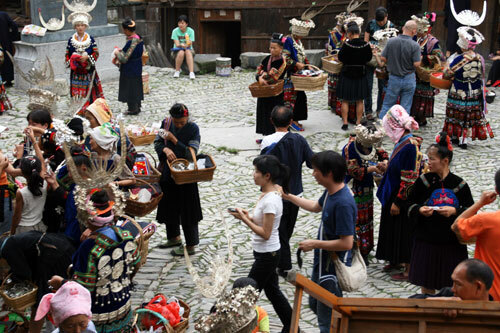 A dispute over what one of the Chinese tour groups should have paid for the performance snowballed into a full-blown row, with the Chinese almost being hounded out of the village by the indignant residents. 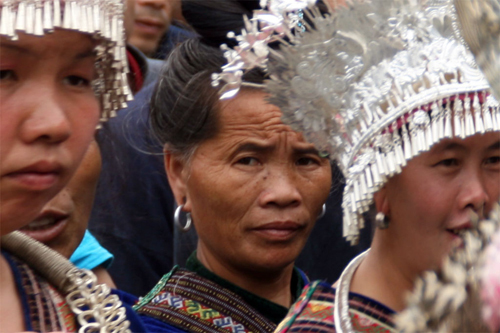 Perhaps the old rebellious spirit of the Miao is still lurking somewhere? Apart from ‘ethnic shows’, Langde offers great hiking opportunities. 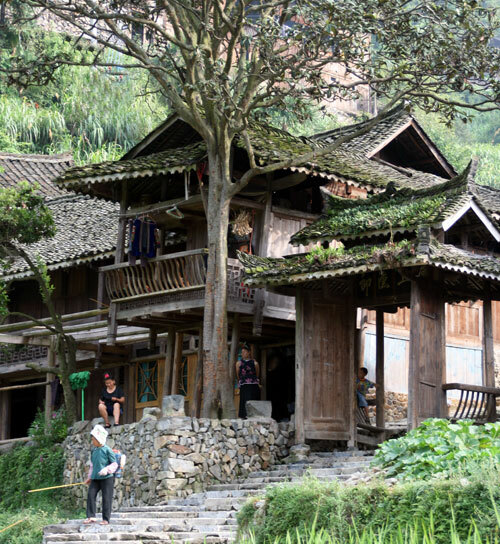 There is an excellent 15-km walk that begins in Langde, marked by a large wooden signpost with a map, and finishes back at the main road near the village of Mao Mao, a few kilometres from Leishan. Apart from the scenery, the route also takes in 5 remoter Miao villages (see map). Coming and going: Getting to Langde is very easy. Take any bus from Kaili heading to Leishan (every 20 minutes) and ask the driver to drop you off at the junction from where you can walk the two kilometres to the village. 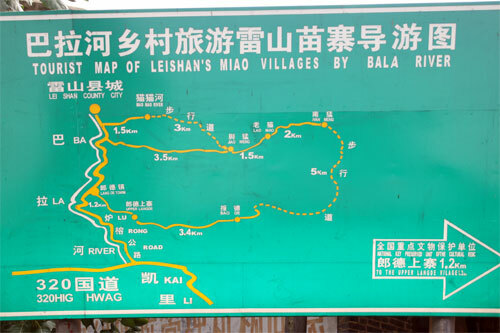 It is also at this Junction where you’ll find the map of the walking route through the Miao villages. Returning: Just walk back to the Junction and flag down any Kaili-bound bus. Accommodation and food: There are several small guesthouses in Langde, both in the centre and on the outskirts of the village, that offer simple lodging and food in a home stay ambience. The one we found in the centre, uphill from the main square, also served as a restaurant. Bravo, beautiful, as usual you outdid yourself. Thank you for the information. I am planning to visit in early October. Can you let me know how did the rice fileds look like when you visited in August ?